The Humanscale Freedom Chair with Headrest's counterbalance mechanism supports users ranging in height from 5' 0" to 6' 4"
Esteemed designer Niels Diffrient invented the ergonomic chair of dreams that forgoes levers and knobs to bring you the best in seating solutions without the hassle of manual adjustments. The Humanscale Freedom Chair with Headrest's supremely ergonomic design works with your body weight to let you move and recline the seat hands-free. Contoured cushioning supports you where you need it while allowing users to individually position each part of the office chair to fit the body. It's truly comfortable, customizable sitting, your way. Ergonomic support comes in all shapes and sizes, with many bells and whistles to help you find that supportive sweet spot. Choose your ideal seating setup - pick your arms, cushion contouring, seat height, upholstery options, and floor casters - with the hugely popular Humanscale Freedom Chair you can feel what better ergonomics can do for your work style just by changing up the way you sit. 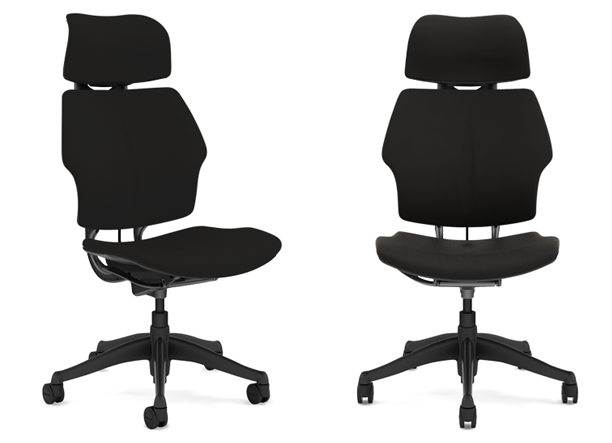 Looking for an ergonomic chair with optimal breathability to the back? The Humanscale Diffrient World Chair with Fabric Seat can help bring you to a more comfortable working experience with a single seating upgrade. Counterbalance mechanism supports users ranging in height from 5' 0" to 6' 4"
You may order a basic version of the Humanscale Freedom Chair that will ship out the same business day, if ordered before 2pm CST. Does this require any assembly? The Freedom Chair requires minimal assembly. Just position the upper chair assembly onto the base of the chair and you will be enjoying your new Freedom in no time. The headrest cannot be removed from the Humanscale Freedom Chair, but you can order the chair without a headrest. What is the "box stitching" option on the leather version of this chair? Box stitching helps hold together the pieces of leather. It is required on the all leather Freedom Chair, but you can choose the color of stitching that you would like to accent the leather. Have I seen this chair on TV? You likely have! The Humanscale Freedom Chair is an iconic chair that has been featured on many TV shows, including the show 24. Do the Freedom arms swivel? 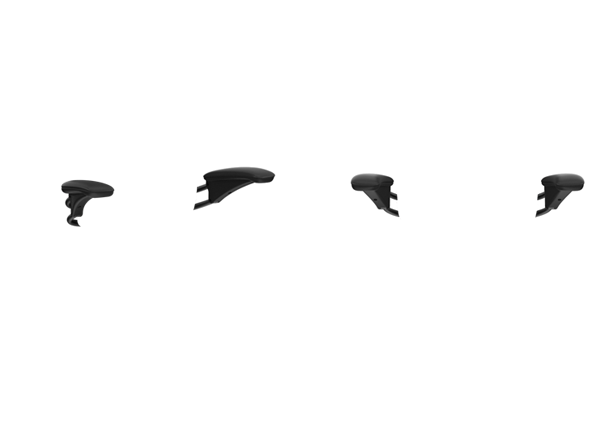 Although older versions of the Freedom arms did swivel, the new arms slide inward. The Freedom Chair is available with three frame colors: graphite and titanium frames are standard colors, and the polished aluminum frame is an upgrade available with either titanium or graphite shells on the cushions and arms. Humanscale offers a standard padded foam or gel seat cushion on the Freedom chair. Both seats are very comfortable, but the gel seat upgrade offers better long-term support and relief of pressure points for users that sit in their chair 8 to 10 hours a day. The Freedom chair offers four caster choices. Most of our customers select the standard casters for carpet floors or soft casters for hard floors. Glides are perfect for a stationary chair, and the locking casters let the chair move around when no one is sitting down. I've owned one of these for over a decade and it has been a never ending stream of broken parts. The armrests have been replaced 4 times alone. The last time they sent a cheaper armrest (no cloth) and wouldn't replace it. Now the gas spring is kaput and you can't get a replacement without knowing the year yours was manufactured. This is, of course, not on any label. All told, it was just not worth the money. Beautifully paid artfully packed. Wonderful chair. easy to sit in without adjustments! I love my chair. It's so comfy and I don't have a adjust it! I just sit and it let's me move back and forth. Great lumbar support too. It's a keeper! I've bought 3 different high end task chairs and this is my favorite because it fits both small and large people, so it's interchangeable in our office. I also got the optional mid-range cylinder so that it can be used at a low, standard desk height or popped up to use at our higher desks. The gel seat is very comfortable and I love the simplicity of adjustments. I have been searching for a ergonomic chair that will work for me for several years due to advanced lumbar, thoracic, and cervical osteoarthritis, several compression fractures due to sports related injuries, tennis elbow (mouse elbow), carpal tunnel syndrome, and a lifetime history of repeated pilonidal disease. My job is at the computer all day plus I am a full time online student. The Freedom Chair with the gel seat, head rest, and adjustable arm rests, along with a narrow keyboard has been the end to my long search for pain relief while spending many hours at the computer. This is an amazing chair. It gives me perfect spinal and neck support throughout the day without having to mess with any levers or knobs as I change positions. The gel seat is a must for anyone with coccyx issues. Those contoured ergo seats that have a bump in the middle always caused pain and skin breakdown at my tailbone. I have not had any problems in this area since I have been living in my Freedom chair. My symptoms of carpal tunnel and tennis elbow have disappeared due to the adjustable arm rests that move with me when I lean back throughout the day. I purchased this chair for my home, but took it to work to use until the identical chair my employer purchased for me is delivered. This chair is well worth the money. If my employer did not purchase one of these chairs for me I would be loading it up in my pickup every day and hauling back and forth so I could use it for my job and my course work at home. The bonus of this chair is its beauty. It's beautiful, red leather, and provides the lumbar support I need for long hours in front of my computer. Also noticed the chair in the recent Mission Impossible film. I'm pleased with my purchase and thank you Humanscale for the 15% special last month and the foot machine. I receive the chair promptly, and it was exactly as ordered. This is a wonderful chair. Very comfortable. Aesthetically beautiful. Highly recommend this chair. I love the reclining action of this chair and the feeling of quality. The armrest lowering/raising mechanism is a bit finicky with its ratchet type system but easy to use. All of the adjustments are easy to make. If you're like me and do some of your best thinking in a chair that inspires you, then look no further. The saddle leather goes great with my airplane wing desk. Had a problem with the gas lift out of the box. Would not respond to any adjustments. Humansolution sent out a new gas lift and base in about a week, no questions asked. Great service! And my chair is now fully functional. I see many years of productivity sitting on this throne. Overall I am satisfied. The seat could be a little less smoothe as when I lean back I tend to slide forward - not a big deal. $1,119.00 List Price: $1,258.00* The list price is the same as the MSRP (Manufacturer's Suggested Retail Price). It may not necessarily be the price at which the product is sold.